Word has reached History Education Hawaii that the final hearing for the Judiciary's budget bill, which includes funding for the Judiciary History Center, is scheduled on Friday, April 1, 2011 at 9:00 a.m. The bill, HB300 HD2 SD1, has already been heard by the House of Representatives' Judiciary and Finance Committees. Its third and final hearing is with the Senate Committee on Ways and Means. Our friends at the Hawaii Judiciary History Center are asking for testimony one last time. IIt should be pointed out that each time the bill passes a committee hearing, it is amended. The bill's next hearing requires a new record of testimony. If you didn't have a chance to submit testimony for the previous hearings, History Education Hawaii hopes you'll take just a moment to do so. For those of you who were able to testify, please resubmit making note of the bill's current number (HB300 HD2 SD1). Address your testimony to Senator David Ige, Chair of the Senate Committee on Ways and Means. The testimony must be received by March 31, 9:00 a.m.
You may email testimony to WAMTestimony@Capitol.hawaii.gov or fax to 586-6659 (Oahu) or 1-800-586-6659 (Neighbor Islands). I am writing in support of HB300 HD2 SD1, which includes funding for the Judiciary History Center. 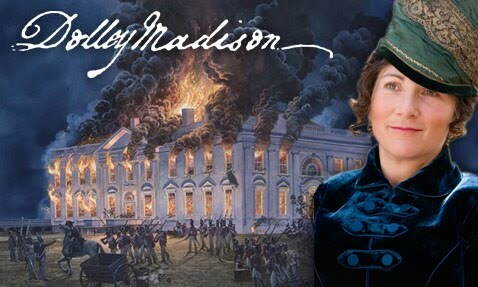 This coming Monday evening PBS Hawaii will be presenting a broadcast on the life and legacy of Dolley Madison on the series The American Experience. Go here for the official web site. Viewers can also go to this link to watch online. History educators, students and historians will be pleased to find various supplemental resources available. These include a time line, related books and web sites, a teacher's guide and more. For these and other resources visit and support the Gilder Lehrman Institute today. the Teaching American History Grant program in 2011. As you know, the federal government is currently operating under a two week short term Continuing Resolution (CR) while both houses of Congress attempt to resolve their differences in how they will approach funding the last five months of 2011’s federal operating budget. There is a great deal of disagreement on the issue of how this will happen and no one is completely sure of what the final result will be. To that end I am asking for help. If you are concerned about history education and preserving the Teaching American History Grant program please contact Sen. Inouye. We share the view with our colleagues at the NCHE that Senator Inouye is perhaps the most key member of the Senate on this decision. Please go to this link and contact Senator Daniel Inouye today. Thank you!